As you prepare to bring a new baby into your home, now is the perfect time to begin creating a clean, toxin-free environment that’s not only safe for mom, but ready for baby too. With so many chemicals floating around, it’s important to distinguish what can stay and what should be replaced. 1. 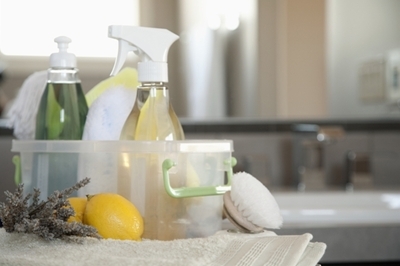 Start with the cleaning products you use in your kitchen and bathroom. Consider swapping toxic, strong-smelling cleaners and sprays for more gentle environmentally friendly brands. The Bio-Life® brand offers biodegradable, non-toxic and phosphate-free cleaning products that are effective for countertops, bathtubs, floors, mirrors, windows and dishes—among other things. There are also plenty of ingredients you may already have in your kitchen that work well as cleaning agents. Vinegar, lemon juice, and baking soda all have natural anti-bacterial properties and are completely safe to use. 2. Choose natural oxygen bleach instead of chlorine bleach and avoid using industrial strength products in the home, as the strong chemicals found in these products can be potentially damaging to the eyes, respiratory tract and skin. 3. Eliminate Volatile Organic Compounds (VOCs), which are released as a gas from products like paint, paint stripper and building materials. There are plenty of paint options that contain no VOCs and these are the preferred kind to use when there is a pregnant woman or baby living in the house. Latex, water-soluble paints should be used in a well-ventilated area. 4. Choose unscented laundry detergent so that by the time baby arrives your clothes and towels won’t contain lingering perfumes, which can cause sensitivities. 5. Have your drinking water tested for lead as soon as you conceive, especially if you live in an older home. Your city will offer resources for testing your water, if you want to be extra-safe install an end-of-tap water filter certified by the National Sanitation Foundation. For information on good water filters visit nsf.org. 6. Avoid smoke-filled rooms. Keep cigarette, pipe and cigar smoke out of your house.